Do you want to feel as light as a feather? What climber doesn't dream of that? The Mammut Women's Zephira T-Shirt was inspired by this dream and impresses with its light weight and a fit that reliably adapts to your movements on the mountain face. BioRe Organic Cotton is an organically produced cotton boasting properties including breathability, comfort and extreme durability – a material that is simply made for top performance on the mountain! 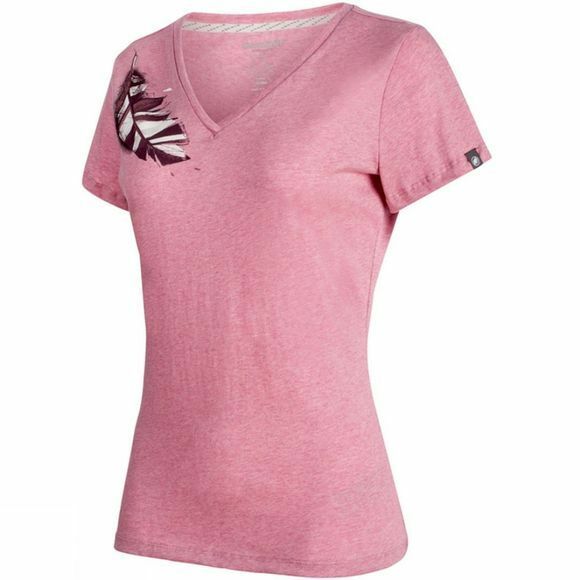 In terms of visual appeal, the T-shirt features a feminine feather print on the shoulder, closing the circle and reflecting the original dream. What do you dream of? Climbing on the summit horn? The Zephira T-Shirt will be with you all the way!